The Mercury News reports early radio transmissions from first responders show PG&E equipment was present near the ignition of the Camp Fire. According to the Sac Bee, a federal judge overseeing PG&E’s criminal probation following the deadly San Bruno pipeline explosion is demanding answers from PG&E about its role in the Camp Fire or other major wildfires. 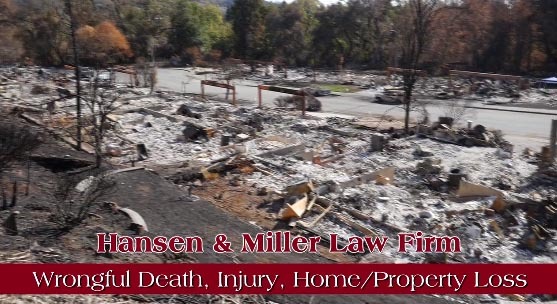 In the written order, U.S. District Judge William Alsup told PG&E to “provide an accurate and complete statement of the role, if any, of PG&E in causing and reporting the recent Camp Fire in Butte County and all other wildfires in California since the judgement herein”. The order added, “What specific steps has the monitor herein taken to monitor and improve PG&E safety and reporting with respect to power lines and wildfires?”. In January of 2017, PG&E was fined $3 million, placed on five years probation, and ordered to perform thousands of hours of community service after being found guilty in federal court of obstruction of justice and other charges in connection with the 2010 San Bruno disaster. That incident killed eight people and injured 58. The probation sentence included a prohibition against committing further crimes. PG&E has until December 3 to submit written answers to the judge and federal probation officials. 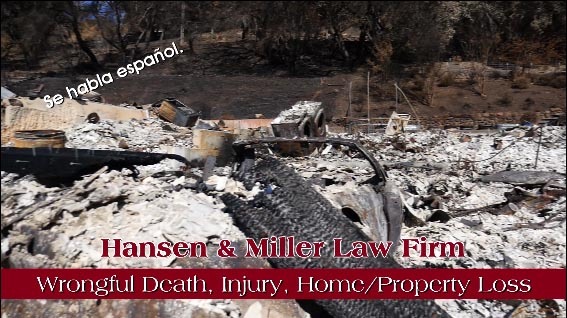 © 2017 - 2018 by Hansen & Miller Law Firm. All rights reserved.